For many children, this time of year is about costumes and candy, but for some parents and children, Halloween festivities bring about food-anxiety and the need for added food scrutiny. From classroom holiday snacks to trick-or-treating candy, this is a time for parents and children with food allergies to be extra prepared. And being prepared means not only keeping your child safe, but also keeping them included in the holiday fun! Don’t let your food-allergic child trick-or-treat alone. Always make sure they carry their autoinjectable epinephrine (Epipen or Auvi-Q) with them. Verify that adults or friends with your child understand his or her food allergies and what to do in an emergency (use the Epipen/Auvi-Q and call 911). Teach your child how to politely say no to food that may not be safe, especially homemade items such as cookies and cupcakes. Review the signs/symptoms of anaphylaxis, including hives, itchiness, difficulty breathing, vomiting/diarrhea, facial swelling, dizziness. If you want to help your neighborhood children with food allergies feel included this Halloween, perhaps consider joining the Teal Pumpkin Project®. 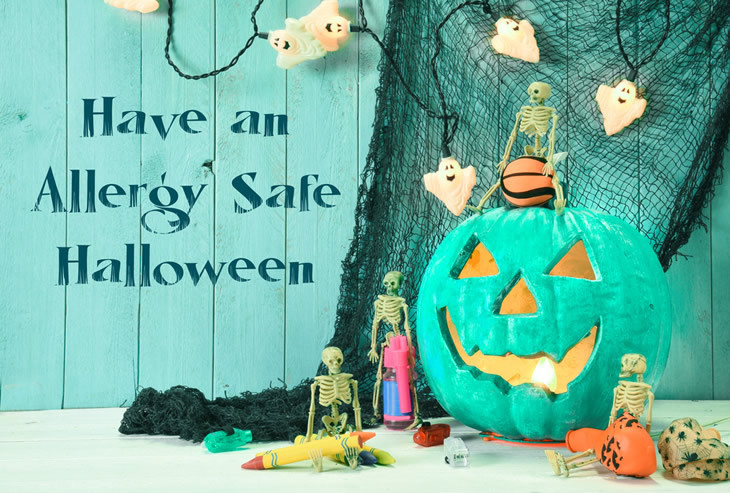 If you are not familiar with this, it is a FARE (Food Allergy Research & Education) project to help raise awareness of food allergies and promote inclusion of all trick-or-treaters throughout the Halloween season. The steps to participate are easy! Serve non-food items on Halloween! Put a teal colored pumpkin in front of your house to let trick or treaters know that you have a non-food item available for them! Sign up at www.foodallergy.org to include your home on the Teal Pumpkin Project® map. Examples of non-food items can include: stickers, glow bracelets, bouncy balls, Halloween themed rings, small toys, pencils, etc. Try to avoid products made out of latex or Play-doh (that may contain wheat) to be extra cautious. You can still handout candy as well, but keep your non-food items in a separate bowl to avoid any contamination of the toys. Remember, some children are highly allergic and even small amounts of food allergens can trigger allergic reactions. This is a time to include everyone in the holiday fun!